Good Riddance, but Thank You. I cannot say I am sad to watch the old year wane into what will soon be, "remember that time last year?" -seeming so long ago. In this year's edition of my annual Christmas letter that I send to about 30 friends and family members, I described the year as being like the little girl in the nursery rhyme with the curl right in the middle of her forehead: 'when she was good she was very, very good and when she was bad she was horrid'. This was not an easy, gentle year, the kind where one event blends seamlessly into the next like a harmoniously patterned quilt, not the kind of year one would describe as calm and uneventful, like a good summer road trip without traffic or delay. 2010 was as full of bumps and bruises as it was full of triumphs and good times with friends and family. It was a year to turn the most prosaic of thinkers into a philosopher, and I think all of us have grown because of it. 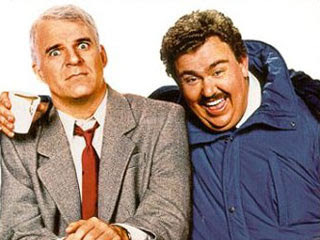 My older daughter and I watched Planes, Trains and Automobiles the other day. That film could be a metaphor for our year. There were moments to laugh along with the characters and moments to laugh, painfully, at them. The two characters, polar opposites played by Steve Martin and John Candy (may he rest in peace), went through every delay and difficulty imaginable while they attempted to make their way home for Thanksgiving, but home they did finally arrive. Or rather, Steve Martin's character arrives home, realizing that John Candy's character is esentially homeless, and invites him in to stay for a while. Through all his trials, and his new relationship with Candy's lovable, generous, but clownish character, Martin's uptight, impatient, selfishly driven character realizes that he has been spending too little time at home and with family, and concentrating too much on work and ambition. He finally truly appreciates what he has, but it would not have happened had he not gone through the comedy of errors which made him look deeply into his heart and examine what he finds there. Every member of my family took their turn to go through something difficult this year. Whether it was a prolonged, toxic social situation at school or a tough predicament at work, a decision to finally say 'no' to something expected of them or 'yes' to something unattractive but needed, a bout with the much hyped 'swine flu', or a sinus infection that went on and on, we all pushed through our troubles and came out the other side alive and kicking. This year, one phrase passed my lips more often than any other: 'It could be worse.' After all, all we were dealing with was what most other families deal with from time to time. We didn't endure a Tsunami and lose loved ones, have our home shelled by enemy gunfire, lose our jobs to a giant global recession, or lose our home to fire, flood or devastating earthquake. We are still here, carrying on together as before, which is a good place to be. One of the trials of 2010 happened just over a week ago. My husband, on his day off and relaxing with our youngest while I took the others shopping, came down the stairs to help us bring up the groceries, when he felt two sharp pains in the left side of his chest and a numbing in his hand. Like pneumonia or broken bones, chest pains are cause for concern and a visit to the doctor, so off we went at about 1:00 pm to the emergency ward of the closest hospital. We were admitted straight away, but as soon as the nurse took my husband's blood pressure and temperature, which were normal, we were demoted to almost the bottom of a long list of waiting patients. And wait we did. Finally the doctor, a thin, youngish woman in high heels clicked her way over to us, examined my husband, and ordered some tests. The tests were taken and we waited almost two hours for the results. The staff brought us a meal to share, and then I went off to phone our children and talk them through the making of their own supper. When I returned my husband informed me the tests had come back negative but that we would have to wait until 11:30 when a second blood test 'just to make certain there was no damage to the heart' would be administered. If it came back negative we would be able to go home. By then it was dark outside and a few patients had been admitted to the ward for overnight observation. As the hours went by, a little girl coughed and cried, coughed and cried, and the very ill gentleman beside us also coughed painfully and moaned for the nurse repeatedly. I went to make another call home, and soothe my youngest daughter, who was crying over the phone. When I returned I went up to the nurse's desk and said, did we really have to stay here another six hours if all the tests had come back negative the first time? Yes, we did. I began to feel like a caged animal and said so. The nurses laughed and the doctor said they did sometimes, too. I briefly considered making a fuss, but I knew that would be stupid. We simply had to wait for the final test results. I could have gone outside for a walk, but the hospital is in the middle of a dark wood and there is nowhere to go without walking a long way alone in an unfamiliar town, so I stayed with my husband who appreciated the company. Fortunately, I had brought a book, so while he rested and slept, I read...and read, and when he was awake we talked. We both knew by then he had not had a heart attack, but believed the chest pains were some kind of warning. Finally, just after 1:00 am the night nurse, a tall, businesslike young woman, though not unkind, came in and gave us the 'all clear', with the promise from my husband that he would visit his own doctor as soon as possible to explore other explanations for the chest pains. We thanked her and went out into the silent darkness, where the lunar eclipse, the only one to occur on the Winter Solstice in 500 years, was ending and a thin, orange slice of moon peeked out from behind the dark circular shadow of the earth. It occurred to me then that our eleven hours of waiting in the hospital were such a tiny speck in the vast universe. We drove home accompanied by that lovely, unusual moon, and went, ever so gratefully, to bed. The next morning, as soon as he was awake, our girls ran into the kitchen and hugged their dad fiercely. He gained an extra day off out of the ordeal and went later to our own doctor, who told him it was all due to stress and that, though very healthy due to good eating and plenty of cycling, my husband would have to make some changes in his work/life balance. This, of course, is much easier said than done for an awfully conscientious man during a record busy time at the hotel where he works, but hopefully, things will slow down a bit come the New Year as they usually do. If they don't, well, we will have to make some decisions. 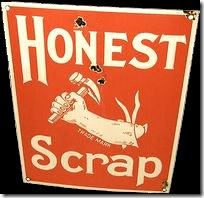 So, we welcome the New Year, which will be "new with no mistakes in it yet" (Anne of Green Gables). That is the gift of the seasonal, episodic nature of life. All good things come to an end, but all bad things do, too. What does not kill us makes us stronger, and hopefully, more sensible, more patient, and more generous toward others. As I ended my annual Christmas letter: Bring on 2011...2010 you trained us well! A dear friend sent this little video to me last week. I loved it, my teenagers thought it was great and the eldest even posted it on his Facebook page, so that proves its worth as a thoroughly modern retelling of the age old Christmas Story! We are baking gingerbread today, for fun, and enjoying this point in the holidays when most of the work is done and all we have to do now is sit back and open our arms to Christmas. A very Merry Christmas to all. Peace on Earth! This is the time of year for clutter in our house. We move the furniture closer together in the living room to accommodate the seven foot tall Christmas tree, we unearth the lights and decorations and the manger scene from the basement storage, fill the table with the Advent wreath as well as piles of odds and ends from various projects on the go, and make list after to-do list that we stick on the fridge next to the calendar and check more than twice. My house is starting to feel very crowded and I am okay with this because I know it's temporary. And besides, all this bright and happy clutter in the house is very cheering on a gloomy, Wet Coast day like today. She placed a village tree in the middle of her display and grouped around it a merry little band of nuns I inherited from my Granny. The paper snowflakes were made by my younger daughter. One of the houses is a mini replica of ours. Can you guess which one? I used to do the decorating, with a little help from the kids when they were small. Now it seems I have handed that torch to my willing Emma and her assistant. My girls share a room and have a string of lights and their own little tree set up on a dresser. When I go into their room to get them up in the morning I plug in the lights at their request so they can wake up to warm little orbs of colour. I am glad the girls want to take over some of the Christmas preparations. I'm busy keeping track of when next to pour rum on the Christmas cakes, baking for all the events, and putting cards, letters, and packages together. It's a lovely way to spread the workload and the joy, so I give them free reign to do what they like, as long as it doesn't involve a stuffed dog that woofs 'Jingle Bells' (a present we once received from a relative) or is liable to catch on fire. And what about the boys? They are more than happy to sit back and let the girls do their thing, with the thought that 'too many cooks spoil the broth' or something like that. They used to be more involved in the preparations, in fact, one year, our eldest made coloured icebox cookies as gifts for everyone he knew. They have different ways of contributing now that they are growing up. Our younger son, the violinist recently accompanied his two sisters at a Christmas recital, and will play at Midnight Mass on Christmas Eve. We will play carols together, I am sure, over the holidays, and he will join in the decorating of the gingerbread cookies we will make next week. He's also very good for games. Our eldest son will enthuse over all the food, repeatedly, and offer to do extra dishes to help out. He will also rent movies he thinks everyone will enjoy watching together and buy snacks to share with his own money. Last year at this time I discovered a couple of cheerful, heartwarming gems to read during the Advent and Holiday Seasons, and this year, after just recently finishing the gritty, disturbing-at-times, absolutely gripping novel The Girl With the Dragon Tattoo, I am more than ready to continue my annual tradition. It is so easy this time of year to get caught up in the frenzy of activity, especially when you have children: extra rehearsals for concerts, the concerts themselves, parties, baking and cooking for various events, Christmas shopping, decorating, writing the annual Christmas letter, addressing cards (yes, I still do this by snail mail), packaging up parcels for faraway friends and family, "etcetera. etcetera, etcetera", as the King of Siam is known to have said. It is all fun and definitely worth doing, but it can be exhausting if I do not take a little time every day to just sit and relax. Reading seems to be the perfect antidote to the wearying effects of a busy day. As I think I've mentioned before, I like to soak in a hot bath before I go to bed at night. 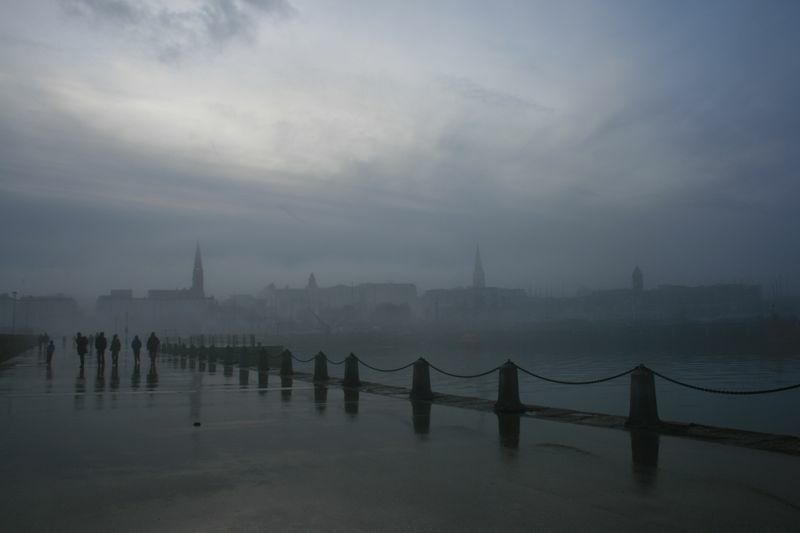 I find it a challenge to keep warm in this damp climate in winter, and if I get into bed cold it can take me a long while to get sufficiently warm enough to sleep. I look forward to my evening soak and always take a book with me. 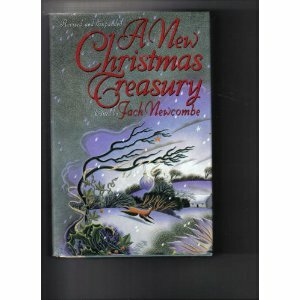 I have just begun reading a book my parents gave me years ago called A New Christmas Treasury edited by Jack Newcombe. It's a fat tome filled with short stories and poems, but I have yet to read much that I would describe as 'cheerful and heartwarming' in it. So far I have read two rather chilling ghost stories that happen to take place on Christmas Eve and Hans Christian Andersen's 'The Fir Tree', which is more of a cautionary tale than anything. Fortunately, I also have read the story 'The Rescue' by Cleveland Amory, which is a sweet story about the Christmas Eve rescue of a starving and injured cat by an animal welfare agency, so there is hope for the collection yet! The other night, my nine year old daughter asked me to read her a book. She is a voracious reader herself, but she seems to have rediscovered the coziness of sitting on my lap under a blanket and listening to me read a favourite story. She is participating in something called The Reading Challenge at school. The group has to read five novels over ten weeks and then attend an event where they go up against other schools in the district answering questions that test their comprehension of what they have read. To break up the monotony of reading books that have been prescribed by someone else, she is nightly hauling out all the Christmas picture books we have collected over the years and enjoying them greatly. This particular night it was a little past her bedtime, but she must have known if she asked me to read her the book she held in her hand I would give in. 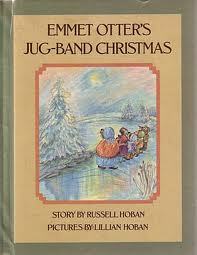 Emmet Otter's Jug-Band Christmas by Russell and Lillian Hoban is a favourite story that I knew as a film before I knew it as a book; the inimitable Jim Henson made a sweet and funny Muppet-tale of it when I was a youngster. Now we own a DVD of the film, which my girls love, and a copy of the book. Emmett Otter's Jug Band Christmas is everything a Christmas story should be. It is about some characters that have very little in the way of material goods, but everything in the way of love for each other, and its storyline is similar to The Gift of the Magi by O. Henry. In the story, the mother otter and her son risk everything to give each other a very special gift for Christmas, which does not work out very well, but results in something infinitely better for not only the two of them, but for some of their friends, too. It is the kind of story that brings me back to my roots and to the true origins of gift giving. It also kind of counteracts what I heard in a store the other day. I was buying an amaryllis as a thank-you gift and the woman who works at the shop offered to take off the price sticker off the plant's container for me: "Or I could leave it on. That's what I do when I give something expensive to my sister, so she knows how much to spend on me in return." When one has the means to "make Christmas and keep it all year long", in a material sense, it can, I find, make life a bit intense at this time of year. In my family, we are not big on expensive gifts, but we do put a lot of thought into choosing presents for each other. We have traditions from both sides of the family, special foods we cook, special treats we bake, decorations buried for eleven months of the year we unearth and dust off, and the house to clean and make ready for guests. We do all of this because we can, but there are many that cannot, or have lost the will to try. Christmas can be incredibly hard for some. When I read a variety of stories from a variety of writers who all keep Christmas in a different way, it opens my mind and expands my view. It makes me incredibly grateful for the love I am so fortunate to have, the life I am so blessed to live, and gives me a deeper sense of the true nature of this magical Season. It also gives me faith that if I were to lose everything I have, I might still be able to celebrate, if only in my heart and imagination. Which is no small thing. In my adult life have dressed in many different Halloween costumes, an evil nurse, a go-go dancer, a fortune teller, The Burger Queen, etc., but none of these costumes attracted attention like one in which I attended a dance in the late 1980's. I have never been what you would call a 'Marilyn Monroe' type. I am better known for my glowing health, a cheerful spirit, and good teeth. That must have been why, when I showed up to the party dressed as a politician who shall go unnamed, I got the reaction I did. Everyone loved to hate this particular politician, especially in my town. She had an awful nasal whine, an uptight persona, a full head of dyed blonde hair, and her government had been responsible for closing down our university in the mid 1980's. I couldn't think of a better costume idea for the dance at the Student Union Building, and I put together an outlandish outfit for the occasion. A good friend of the family had an enormous costume collection, which I had borrowed from several times. I decided I would be the politician attending a ball to meet the Queen and went all out. I chose a long sparkly sleeveless dress which had been tailored for a well-endowed woman and so I stuffed the chest area to the point of capacity. I wore long white gloves and plenty of gaudy jewellery, strappy silver sandals, and a poufy blonde wig. I wore an inordinant amount of blue eyeshadow and red lipstick and removed my glasses. As I left the house I took a last look at my reflection and decided I looked absolutely hilarious. I had just endured a heart-breaking but much needed break-up with my boyfriend, and my sisters and I were fully prepared to enjoy ourselves that evening. When we arrived at the S.U.B. we were greeted by Didier, a Swiss-French art student whom I had known for a year. Fully prepared to be received with a laugh, I entered the room in character and bought my ticket from Didier. I was not greeted with a laugh and a good-natured 'great costume! ', no. Instead, Didier looked me up and down with a bit of a leer, and said quietly, "We must dance later." Hmmm. Not quite the reaction I was expecting, so I raised my eyebrow at him and moved on. I had barely had a sip of my drink when someone asked me to dance. Never before had I been asked to dance as many times as on that night. Most of my partners were good fellows that I had met at least once, and I had a super time, but I maintained a slightly uncomfortable feeling that they had forgotten who I really was. I never really knew if it was I they were asking to dance, or my alter ego, 'Grace', so when one of my dance partners asked me out on a date for the following night, I declined. I wasn't ready to be 'out there' in any case. When I went home and removed my costume, I felt relieved. For a short time I had felt what other women like the real Marilyn must have felt, and I was glad to be me. Okay, so my tale is not exactly 'harrowing', but it is a little unnerving. And I like alliteration. The photo is not the real Marilyn Monroe of course, but is a model advertising a 'Marilyn' wig. I was in a photographic mood yesterday. I decided that I was not using my camera enough lately and because I wanted to take a couple of photos for this post I ventured out in the drizzle to do so. The light was not very good due to the greyness of the day, but I did what I could before it really started coming down. Our town is filled with trees of all varieties. We have been home to a Federal agricultural research station for more than a hundred years and everywhere you look, there are ginkos, magnolias, white and pink dogwoods, copper beeches, every kind of maple, tulip trees, and a lot of other varieties I cannot name. Across the street from us is one of the most stunningly beautiful copper beeches in the neighbourhood. I cannot begin to express how much joy it is to watch that tree change with the seasons. Last year the neighbour built a very tall garage for his boat. An arborist was called in and began cutting off all the lower branches. I immediately rushed outside and found the neighbour. He assured me they were only trimming the lower half to make room for the garage (which I secretly call 'the fire hall'). Not so long ago a simple, white 1950's house sat elegantly in the middle of one of the prettiest yards in the town. What made the yard so pretty were several mature trees, including a locally famous huge pink magnolia, and a well-kept lawn. The residents of the house were quite elderly and employed a local landscaping business to mow, trim, and maintain their shrubs and lawn. Just recently the house went up for sale, was sold in a week, and within days I saw a crew beginning what looked like a thinning of the trees on both sides of the house. I wondered if the new owners had decided the yard needed more light, and I could understand that. A few days later I walked by again and saw a certain local figure standing on the property overseeing the proceedings. Several trees were now completely cut down and it appeared the lots on either side of the house, which was now rented out, were about to be nearly emptied of trees. The shrubs and the beautiful magnolia which fill the lot of the rented house were left basically intact, though the magnolia had been given a major pruning. The 'certain local figure' is a property developer who plans to build three new houses on the bare lots. Our town has a land use plan which preserves much of the agricultural land and encourages high-density new- builds, which is good, but there is absolutely no law protecting trees. I remembered a Japanese student from my days as an ESL assistant, asking me why Canadians were so concerned about protecting forests when there were trees everywhere he looked. As I stood in the rain looking at the stumps and rounds of wood across the street I wondered if I was being too sensitive. True, the city had just planted a neat and tidy row of baby trees all along the boulevard, the entire length of the street - although I couldn't help cynically imagining it was some sort of ploy to soften public opinion as a rather angry letter-to-the-editor had already appeared in the paper. I think I, and many other local citizens are upset for a few different reasons: there was absolutely no public consultation before the cutting started and I have yet to see any statement of plans by the developer; we have lost about half an acre of beautiful, mature trees that were enjoyed by everyone in the neighbourhood, not just the owners of the white house; It seems that in this town, if it isn't in the museum, it's not worth a thought. It's out with the old and in with the new. I know the new houses will contain families and they will most likely plant shrubs, but their yards will be very small. We are quickly losing many of the older houses and their trees as high density development charges ahead. The road into town, which used to be lined with large properties and older homes of character, is fast being filled with cookie cutter townhouses. I suppose this kind of progress is inevitable as more and more people move out to the Valley from the cities of Vancouver and Surrey, and they need homes, too, but it is still hard to witness the transformation. When I moved here, I never thought of this town as suburbia, the definition of which, according to Alfred E. Neuman is 'a place where they cut down all the trees and then name the streets after them,' but it certainly is starting to look like it in places. I'm truly grateful that we can still take walks and runs and bike rides on the farm roads, where the fields and trees provide a much needed sense of space and beauty. The other day I noticed yet another change on the street in question. The house directly across the street from the white house is now for sale - further proof I'm not the only one a bit disheartened by this recent turn of events. On a lighter note, Halloween is approaching and we gathering pumpkins, assembling costumes and making decorations. My eldest daughter made a great skeleton out of plastic milk jugs on Sunday afternoon. She found the instructions on the web. Note his friend the hatted spider to his left. And while she made 'Bones Malone'﻿ and I prepared for a meeting, her dad watched the football game on his one day off of the week. Yup, it's fall! There was a time when my husband and I believed three kids were enough for our family. Our first three children were all born within three and a half years and I am the first to admit that the third child, often sick in her first six months of life with some kind of respitory illness or another, just about sent me over the edge a few times. It is during those moments when decisions born of fatigue and frustration rear their ugly heads: I will never have another baby. NEVER! Time moved on, however, and life became easier. My third child, Emma, finally slept through the night by age two and slowly, gradually, I awoke to a renewed version of myself, one with more energy and patience. By that time I was twenty-eight and we had lived nearly a year at Strathcona Park Lodge on Vancouver Island. The lodge was a tiny, fairly remote community and to combat cabin fever I had begun to jog a few miles out the highway as a means of escape. In the warm months the community swelled with beautiful, young twenty-something employees and I revelled in evenings out with them to parties, movies, wing nights at the pub in town, etc. 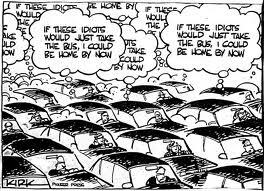 I also took my children to visit friends in town and spent a lot of time driving to and from. It was on one of these return trips that my kids and I were involved in a car accident. A man driving a large pickup truck ran a stop sign when his brakes failed and made a left turn onto the highway in front of me. I hadn't enough time to stop and slammed into his rear left wheel with the front of my car. My children, all in the back seat, were fine, but I was injured and was taken by ambulance to the hospital. It took ten months of physiotherapy, massage therapy, and a customized exercise program before I could even think about running again. During those ten months of pain and recovery, I began to look at life a little differently. My car accident had a sobering affect on me. Up until then I was so busy trying to reconcile being a young, vibrant woman of the world with being a mother to three small, needy children, that I was often making decisions that were convenient for me, rather than what was best for them. I had good intentions, but my selfishness was continually getting in the way. I began to see life as being a precious gift, and because I had not died in the accident I was being given another chance to get it right. I know it sounds trite, but that doesn't make it any less true. Fortunately, I am married to a loving, faithful, patient man. When I asked him later how he put up with me during that time before the accident he said, "I was just waiting for you to make your way through it, as I knew you would." It was so good to be running again, and I began piling on the mileage. I looked forward to signing up for the Comox Valley half marathon and was invited to join a trail running group in Campbell River. I was strong and a little too thin, but life was rich and I was happy with my children who were now seven, six, and four. Everything was going smoothly, and manageably, but I began to secretly yearn for a baby. I suppose I am a little like the mother in the Steve Martin film Parenthood: "I LIKE the rollercoaster!" When asked if I would ever have another baby, I would say with a laugh: "In a heartbeat, if it could be a girl - a sister for Emma." My husband was not convinced we needed any more children, however. "Isn't three enough? Besides, we are finally starting to be able to do things with them like go for hikes, and they are getting more independent now." He was busy with work, playing on a soccer team, and coaching our childrens' teams in town. Theoretically I agreed with him, but I still looked at other people's babies with longing in my heart. I soon became so overheated I had to stop and shed several layers. Early the next morning, before the kids were awake, I knew it was time to tell my husband about the baby. I went downstairs where he was making the fire and gave him the news. He took me in his arms and held me close while I smiled with something like joy through my tears. We both knew the challenges of having an infant, but we were in this together. By Mother's Day in May I was over morningsickness (misery times ten), and when asked I said I knew my baby would be another girl. Several people joked that I just said that because I wanted her to be a girl, but I just knew. On October 17 at 7:50 p.m. Katherine was born after only 50 minutes of labour - hers was what they call a precipitous birth. She exploded onto the scene of our family life and has never let up. From almost her first days she has been trying to keep up to her older siblings. To them, she was a the best present I could give them and they took to looking after her from the start. They all helped so much that she became, in every sense, 'our' baby. Katie began talking at nine months, and has always expressed herself in a manner beyond her years; ie. when she was two and a half and attending the second of her brothers' spring music recitals, Katie looked at me and said, "When is it going to be my turn to go up there?" 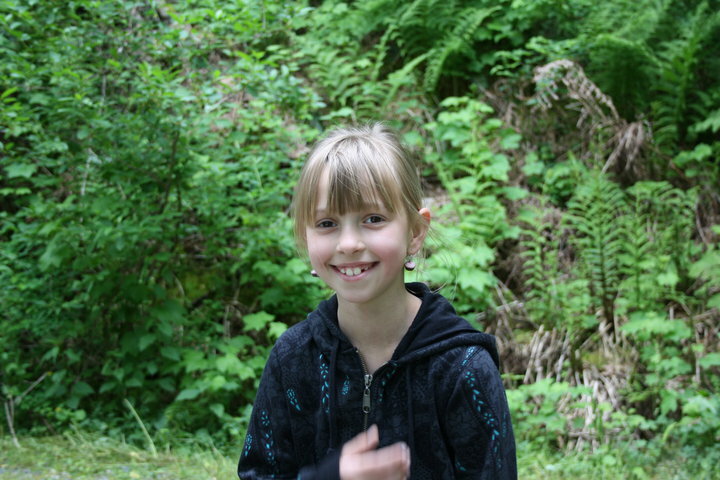 She is keenly interested in music and plays the piano, and loves performing in plays. As the youngest, she has a deep, deep love for her family members. It is like she has put us all in her pocket and carries us around with her. Whenever any of us is sad, she is sad. When we are happy, she is happy for us. When her dad is tired after work, she climbs on his lap and strokes his cheek. When I am busy cooking or working she says things like, "You take such good care of us, Mommy." And I say back, "I'm so glad we still have a little one." But she is not so little anymore. Yesterday, Katie turned nine. She had a small, manageable party ("I don't like big parties, Mom, because it's too hard to make sure everyone is having a good time.") at the swimming pool followed by a favourite supper of Fettucini Alfredo and Caesar salad. Her birthday was a relaxed affair and when I asked her how she enjoyed it when I was kissing her goodnight, she said, "It was good, and I'm so glad Daddy didn't have to work and could come swimming." While I spent much of Sunday in happy solitude baking pumpkin pies and apple blackberry crisp for Monday's Thanksgiving dinner, my family took a drive out to the salmon spawning channels at Weaver Creek, which is a truly lovely spot near the Chehalis First Nation Reserve on the Harrison River. 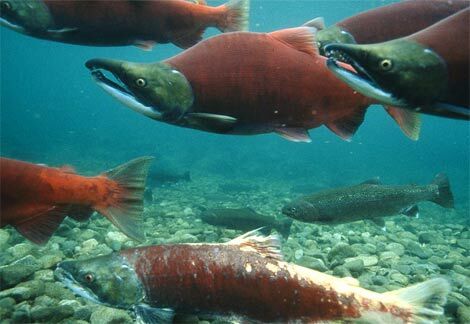 We try to get there every year, but this year my husband, always the naturalist, was extra motivated since the Sockeye salmon have returned in record numbers after the experts' initial gloomy prediction. No one seems to know exactly why the Sockeye run is so great this year, but one thing was clear when my family returned home to report on their outing: the amount of tourists at the spawning channels almost equalled the number of fish. The spawning channels are man-made shallow switchbacks with gravel bottoms and rows and rows of trees for shelter and shade. A visit to Weaver Creek is always a pleasant way to spend an hour or two, even though the scene is a bittersweet one with the red and green fish struggling against the current to return to their birth place, many of them dying along the way. The walk from the parking lot takes visitors alongside the channels and ends up at the creek where the salmon must leap several feet over a manufactured waterfall called a fish ladder to make it into the channels. The reason for the tough entrance exam is to maintain as strong a species as possible; strong fish create more strong fish. It is quite the scene to watch the salmon leap and violently shake their muscular tails in order to gain the height required to make it into the first tank. While I enjoy watching the concentration of fish in the channels, eventually I must always go over the bank, away from the tourists and down to the actual creek. Sometimes, depending on the time of year, there can be dead, mouldering fish all over the creek bank, but if we are early enough in the season we can enjoy the quiet fall scene without the carnage: the meandering creek with water rippling over boulders strewn here and there, the natural riparian plant life dressed in its fall finery, and the occasional languishing salmon that has managed to make it past the weir, which is designed to keep them out of this particular part of the creek. The huge sockeye run this year had almost everyone I know here out fishing for their allowable daily catch of two salmon during the short open season, and freezers all over the Fraser Valley are brimming with frozen fillets. A group of boys would cycle past my house every day after school with fishing rods in hand, and joy on their faces. The mighty Fraser river was packed with boats, nets, and people in hipwaders, and the rural roadsides were lined with vehicles. The local Stolo First Nation people value the salmon above all other creatures. From infancy they are taught to revere the cycle of the red fish. Their artwork is full of depictions of this cycle and its importance spiritually and literally to their culture. A native artist once brought a cooked salmon to his art opening and urged me to try the salmon roe. I tasted the small red caviar and an incredibly oily, fishy sensation went down my throat. I can't say I enjoyed it, but I could see how it would be the food to eat when fattening up for a cold winter. When we lived on Vancouver Island I learned to bake a stuffed salmon and did so fairly regularly. Pink salmon, a variety light in colour and less rich than other varieties, was sold in season for nineteen cents per 100 grams (about a dollar a pound) and was incredibly available, so it seemed the thing to cook. I have never loved salmon, though. Not like so many other people. When I was a student, one of my roomates was a fish biologist with constant access to free salmon. He barbecued it with a teriyaki marinade, and it was good, but I think too much of a good thing is well, too much. I have been to several outdoor picnics that involve cooking large fillets of salmon skewered on a long stick and placed right next to a fire. While the guests raved about the fish, I ate it, thinking, "Yeah, it's salmon." My friend Bridged belongs to a prestigious fishing club in Campbell River called The Tyee Club. Members must use only a row boat to fish from, and every year the largest salmon caught (they are called Tyee due to their enormous size) is dipped in ink and pressed onto paper for an imprint. Bridged won the trophy a few years ago and now, an enormous framed print of a thirty-odd pound fish decorates her house's entrance. She also ended up with a truck load of smoked salmon as she was allowed to keep the fish for eating. She could not have been more thrilled, but then, Bridged grew up fishing for and eating salmon. Maybe that is my problem: I didn't grow up on the Coast, relying on and thus revering The Sacred Red Fish. I confess I haven't got a single salmon in my freezer. We are not a fishing family, and when my eldest daughter eats fresh salmon, particularly Sockeye, she usually becomes ill; it is quite rich. I spent some time in the grocery store the other day wondering if I should buy a three pound Sockeye for fifteen dollars. I was feeling badly about not taking advantage of the big salmon run and no one had offered me a salmon from their own catch (not that I asked), so I hemmed and I hawed, I considered my husband's opinion (which was that we didn't love salmon enough to pay fifteen dollars for one), and then I walked away from the fish section. My freezer is already full of beef and chicken from a local farm and I try to make half of our meals vegetarian, so we can only eat so much meat, fowl and fish. This makes us somewhat of an anomaly around here; to live on the Coast is to eat freshly caught salmon, and lots of it. My family's 'wild pacific salmon' comes out of a store-bought tin, already caught, gutted, cooked and with no bones to choke on. I generally mix it with bread crumbs, egg and spices to make salmon croquettes or a type of salmon wellington with mashed potatoes as a cover instead of pastry. It doesn't taste quite so 'fishy' that way. Personally, I am happy for all the local people who rely on their yearly catch of salmon. There is a bounty this year for eating fresh, for freezing, canning in jars, drying, smoking and making into a rich delicacy called candied salmon. While I am full of gratitude for a good salmon run for their sakes, I am resigned to cheering from the sidelines...and hope the good harvest makes for good prices on tinned salmon this winter. The photo is by Peter Essick for National Geographic. Fall always seems to me a time of renewal and a natural time for celebration. There is the change of seasons with cooler nights gradually transforming the landscape into one rich in gold, deep red and burnt orange, and the settling in to welcome routines after the transitional nature of September. When I was in school I looked forward to fall with great excitement, like my eldest daughter does now: "I can't wait until it gets colder. Then I can wear hats and cozy sweaters and my new down vest, and cuddle up in blankets with a book!" I think she has a wee twinge of her mother's romantic inclinations; she was also born in the fall like her little sister and me. This past weekend we were invited to a friend's nut picking party. Our friend has a few acres just outside of town, with a grove of several hazelnut trees, the produce of which she was happy to share this year. This is hazelnut growing territory and we use several pounds a year in homemade granola and other baking. My husband works on Saturdays so we didn't arrive at the party until almost twilight. As I performed the necessary social rituals with various guests, my husband and youngest daughter took their pails to the grove and combed the ground for nuts. When our daughter tired of harvesting I joined my husband and picked out the small brown smooth-shelled nuts plentiful among the leaves and mushrooms. We gathered two pailsful before it became too dark to see the ground. After the delicious potluck meal of spicy chile and focaccia bread, various salads, home grown pears, cheese, and moist pumpkin cake enjoyed out of doors, a large bonfire was made by our hosts down in an open part of the property. Marshmallows were roasted with the longest sticks ever seen for that purpose, and later on our hosts brought out a pot of hot apple cider that had been simmering away with whole nutmeg. I think my husband and I enjoyed the evening even more since we had both endured a long, tough day with our noses to the grindstone, and we both felt released from cares which had, just an hour or two before, seemed all-consuming. The next day a small group of us went for a hike to Whipoorwill Point, a spot where a local river meets a local lake. All along the trail leaves fell with increasing determination and we knew it was now fall in earnest. We found several kinds of mushrooms, even some that looked almost like chanterelles, a delicious, buttery fungi we occasionally enjoyed on Vancouver Island, but we didn't know enough to risk a taste test. We had always received the chanterelles as a gift from some friends who kept their source a secret. Next weekend is Canadian Thanksgiving, and a time for further celebration. We hope the weather will be fine as we will go to the farm of some dear friends and stuff ourselves with roasted turkey, scalloped potatoes, the last of the garden veggies and pumpkin pie and then go for a long walk all around the fields, just like we did last year. I suppose it may seem a bit odd to talk about renewal when the year is waning and my part of the world is tucking itself in for its winter sleep. As a parent with school aged children who enjoy a long summer holiday, the fall is a time of new beginnings - a new school year with all its activities, a new year of music lessons, concerts and recitals, the count down to Christmas, and the count up to Easter and my son Ian's high school graduation. As one year fades, another rises up to take its place, and there is great hopefulness in that. I suppose that is the reason I chose to start my blog in September of last year. My friend Alistair, in his comment to my last post, asked me to list the top five posts of which I was the most proud. Since I knew Al's assignment would take me some time, I thought I would make it part of my next post: this one. I scrolled down through my seventy posts of the past year and narrowed my list down to about fifteen. I let that list 'sit' for a few days and now I look at it trying to choose just five. It's difficult because I am enough of an amateur to feel rather attached to all fifteen posts and to not want to deny any of them the spotlight. They are like my little children after all, and having created them I don't want to play favourites. However, I have decided to get on with the job and just select a cross-section of posts to highlight. 1. "I Had a Farm in Africa..." was one of my first posts and written from notes and thoughts I had about the family of my friend, author Antonia Banyard, who did and does have a farm in Africa. Toni and I grew up together and her family seemed incredibly exotic to me, and incredibly classy. 2. The Turning Point is the story of how I woke up one day to the fact that my children needed more from me than just 'survival' parenting. It's also the story of my family living and growing together for five years at a rustic outdoor education lodge on Vancouver Island. 3. Bridges and Tunnels is about the geography of my province of British Columbia, about a favourite spot we like to visit, and on a particular day, how that place made me think of some difficult times we were going through as a family. 4. 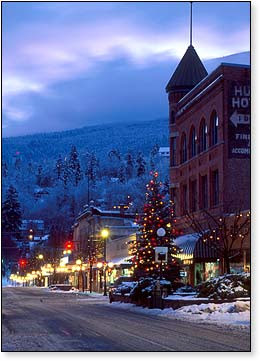 A Child's Christmas in the Kootenays is a post about my childhood in Nelson. My family did not have a car. We walked and hiked and biked everywhere and were incredibly fit, and I tell of one Christmas when we went out in the deep snow, on Christmas night, to go sledding. 5. A Trip from Bountiful is a sort of journalistic piece about two Fundamentalist Mormon girls I met at college. This post garnered the most comments I've ever received and the most attention overall. I try not to judge the young women, who were training to be teachers for their polygamist community of Bountiful, but simply present them in relation to my own experience back then of being a young college student with all the choices in the world and a future of bright possiblilities before me. 2) this is my 70th post and the one year anniversary of Letters to the World. Let's start with my birthday. I am turning forty-one this week. While last year I celebrated my fortieth with a big party and plenty of fanfare, the celebrations are much more low-key this year. I have instructed my family not to make a fuss; I purchased a beautiful digital camera (a Canon Rebel) and a new bicycle this year and those seem like presents enough. In pondering my entry into my forty-second year of life, I have visualized a skating rink as representing my fourth decade. At thirty-nine I entered the arena and rented my skates. At forty I sat on the bench tying up my skate laces and wondering how the ice would feel. At forty-one I see myself as starting to glide around the perimiter of the rink, gradually getting more comfortable and adjusting my balance. Perhaps by forty-two I will be attempting some jumps and figure eights. Who knows? Please don't ask me why I see my forties as a skating rink - I have no idea. It was just an image that came to me. Now on to the First Anniversary of my blog. 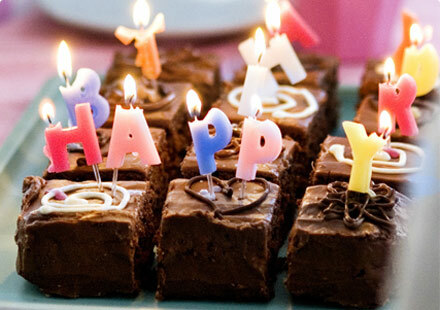 While my good friend Tracey at http://unodostracey.blogspot.com/ is going for two hundred posts by her first blogiversary, and I wish her much success, I am truly blown away by the fact that I have actually written seventy in one year. 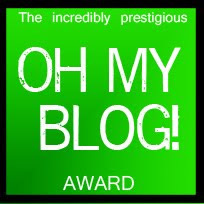 The reason I am so pleased with myself is because in a good year, before I started my blog, I may write ten pieces and feel pretty good about that. But seventy? Utterly amazing, as far as I'm concerned. Oh, I know my posts haven't all been masterpieces, by any stretch of the imagination, but overall, I am extremely pleased with the fact that I have stuck to my goal of producing at least one piece every week. And I have had an increasingly good time doing it! Once, when I was a teenager, my neighbour Vicky, a bookstore/cafe owner asked me what I would like to do when I grew up. I said, "I would like to write a newspaper column, one that would be, like, my take on things. It would be a bit serious sometimes, and, like, maybe funny sometimes, too." Vicky thought that sounded great. I had encouragement in writing from one of my high school English teachers and especially from my parents, but the idea of a newspaper column had by then been buried under new ambitions for a scholarly career. When I went to college, my English 101 teacher, Pauline Butling stopped me in the common room one day and suggested I take the Applied Writing course because I showed some talent in that area. I told her no, I had other ('bigger') plans, and off I went to pursue them. Those bigger plans materialized in my going off to the University of British Columbia, meeting my future husband, getting married, and starting a family directly. So much for the scholarly career, but I plugged away at the writing, producing a novel, several journals, and the odd poem or short essay. When I joined the local arts council in 2003, I volunteered to write a monthly column in the local newspaper about our programs and events. I interviewed artists and wrote feature articles to promote their shows and workshops at our art gallery. I enjoyed the work and it helped me greatly in learning to edit and to get my point across quickly and with style. The monthly column was well received, but after a few years, it was time to move on when I became immersed in other things. The itch to write, however, never left me. From that, there was no 'moving on'. A friend suggested I start something called a weblog, which was a way of self-publishing my writing. My dad had started one the year before (he's the Kootenay Ranger on my blogroll), and I had found the whole concept of a blog fascinating, but for me? I wasn't sure. Last fall, after attending my parents' fiftieth wedding anniversary family reunion, I became overwhelmingly inspired to create a blog of my own with the idea that it would be a weekly column of sorts. It would be my take on things, sometimes serious and sometimes a little humourous, and I would call it Letters to the World. So here I am, now beginning the second year of my blog and on my seventieth post. I almost cannot believe how much more settled into the craft of writing I am, compared to a year ago. What the experts say is true: to be a writer, one must simply write. Once a post is finished to my satisfaction, I am already thinking about the next one. If this blog accomplishes nothing except for the increase in my confidence and belief in myself as a writer, then, in my view, it has been a success. I really do not know what this next year of blogging will bring - hopefully, at least seventy more posts written with immense enjoyment and hopefully received with some of the same. A huge thank you to all my wonderful, loyal readers. Without you and your feedback, this blog would not be nearly as much fun! It's September - the crazy month. With the kids back in school it would seem that my life would be less busy, not more so. Deadlines are looming and new programs are starting up, the schedule is packed and the calendar full. Early in the month I was fairly stressed and not in 'the groove' at all. I felt like I was surrounded by strings and was just pulling them one at a time in no particular order. It all seemed a bit chaotic at first, but if I have learned anything in my nearly forty-one years it is this: the best way to deal with an overwhelmingly full plate is to just get going, to just chip away at the pile bit by bit, and eventually everything gets done that needs doing. It's just a fact that sitting immobilized by the weight of my responsiblities and self-motivated work is no help at all. Long ago, however, in my early days as an adult, I was yet to learn this important lesson. I have always been a procrastinator, and I think this comes partly from a tendency toward comfort and pleasure, and the the need to feel undue pressure in order to focus properly on the put-off task. When I was fifteen, my sister's boyfriend came to visit with a posse of college friends. They were amazed at my ablility to lie on the couch reading for eight hours straight on a Sunday, yet somehow still get my homework done on time for Monday's classes. Years later in University, my roommate was actually quite miffed at my ability to achieve good marks when, for the most part, I seemed to spend most of my time enjoying myself. I am far from proud of my unfortunate habit, for it led to many years of struggle when real life kicked in. My mother started saying 'Just Do It' long before the tough love phrase was ever applied to the Nike brand. When I had my first child, I was immobilized for hours every day because I wanted to delay the inevitable fussing for as long as possible. I would sit comfortably reading and nursing or playing with my baby for hours on end - at least then he (and I) would be happy and calm. When my son was a month or two old, my mom came to visit us in our small apartment. She quickly pointed out to me that it was possible to hold the baby in one arm and stir the spaghetti sauce with the other. "Babies need to cry," she said, as she put him in his bouncy chair and helped me get on with things. My second baby was a sweet, tiny thing, another boy, born when his brother was only sixteen months old. He was a good sleeper, and by then I had acquired that wondrously helpful item, a wind-up baby swing. With two children, and a husband at work all day, I had no choice but to try and become organized. Still, I had to gear up psychologically in order to achieve simple household tasks such as cleaning the bathroom and vacuuming the carpets. I am not completely sure what held me back - my go-getter husband certainly could never understand my hesitation. I truly think I saw household tasks as being achievable only after a lengthy, arduous climb over a very high mental wall, and once this wall was climbed over, and the chore done, I would congratulate myself far more than I deserved. A soothing sense of satisfaction would come over me every time I stepped into the gleaming bathroom, or the just-dusted living room. But it was not to last. Housework, like child rearing, is like beading a string with no knot on the end. Within days the dust would accumulate and the tub ring would reappear. I would toy with the idea of a quick wipe, but no. Keeping up with it just didn't come naturally. Retreating to a living room strewn with toys and baby board books, I would sit by with my book and wait for the mental wall to build itself back up and inspiration to hit me once more. Those days are all but over. I still allow myself to let the pile accumulate somewhat, but that is mainly due to the fact that I try very hard to maintain a balance between work (and I work hard) and leisure - the one is much more successful with the allowance of the other. My husband is learning this, too as he gets older, because as my wise mother also has said, "The work will still be there when you return from your lovely walk in the fall sunshine. It's not going anywhere." Or something to that effect. I am so looking forward to beautiful, spacious October! The tea towel in the photo above was designed by Suzi Warren and is available on her 'twisted twee' website.